The explosion of smartphones and tablets running either Apple or Google mobile operating systems has brought many of us into a new era of mobile computing. Hundreds of thousands of applications are available through both Apple’s iTunes App Store and Google’s Market. While the percentage of apps that are Jewishly oriented is relatively small, there are a significant number already available, with more coming each month. Many of these apps can help enrich Jewish knowledge and life for Jews of all ages. In addition, because they are accessed through smartphones and tablets, they are often enjoyable to use; these apps can even grab and hold youngsters’ attention. This recurring column will offer a look at Jewish apps and other tech devices. While this installment looks at some apps for Apple devices (iOS apps), the column will be platform-agnostic. Future write-ups will focus on apps for devices running such operating systems as Google’s Android OS. There will also be ChaiTech reviews and news on the NJJN website. 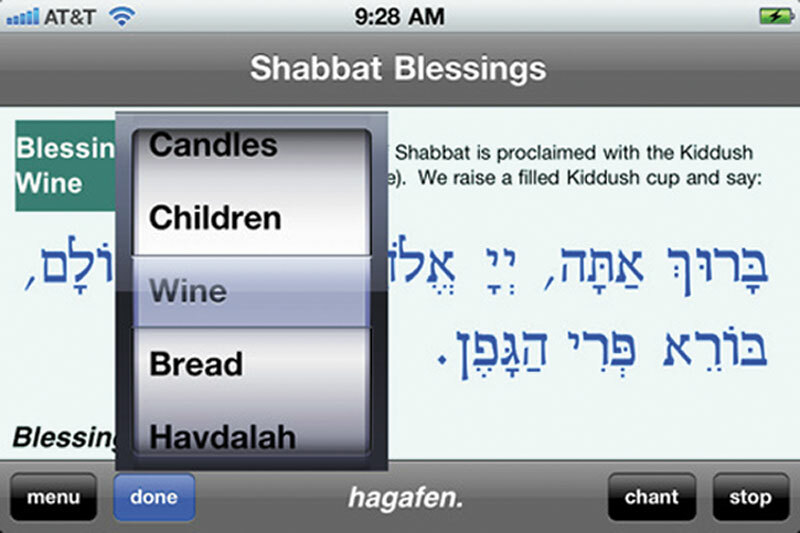 iShabbat V1 (Behrman House, $2.99) is a great way to try Jewish apps. 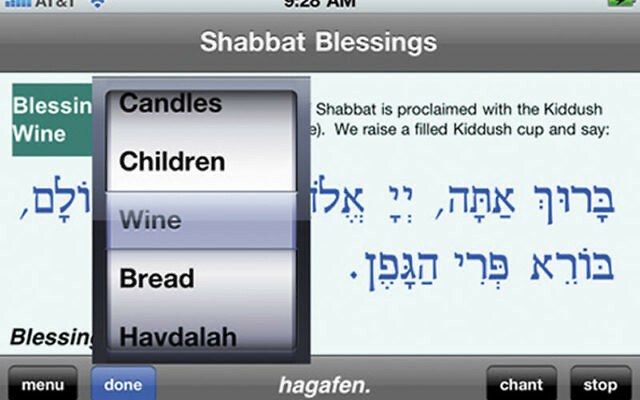 It offers an easy-to-use interface, a basic introduction to the key blessings for welcoming Shabbat, and presumes no prior knowledge or experience with Shabbat rituals or iPhone apps. To make the learning process fun and interactive, Behrman House includes what they are referring to as “Touch-n-Read technology.” The user can tap an individual word and hear it read out loud. The app also includes a built-in audio recorder, so users can record themselves reading each word to play back. This kind of interactive learning makes the process less daunting and more engaging. While this app is quite basic and limited in scope, it is a good entry point into the world of Jewish apps. I hope to see apps with more depth from the company soon. Tanach Bible: The Hebrew/English Bible (Davka, $1.99) offers a clean interface and is a great way to start reading and studying the Tanach in eBook format. The app includes all 24 books of the Hebrew Bible, as well as the Hebrew text of Rashi for the entire Tanach (the commentary for the Torah includes the vowels while the rest does not). The app makes it easy to search by parsha, chapter, and verse and offers the ability to bookmark and e-mail text as well as copy and paste snippets of text into other apps and documents — a feature I found to be quite useful when preparing classes. A recent update made it possible to search in both Hebrew and English, as well as render the Rashi commentary in a standard Hebrew font. When I went searching for an iPad version of the Tanach for personal use and during my Torah class, I chose this app because of its excellent features and ease of use. I am very pleased with it, and at $1.99 it is a bargain. Amazon Kindle for iPhone and iPad, though not specifically a Jewish app, is worth including here because the Amazon Kindle bookstore makes it possible to build an entire Jewish virtual library that can be carried everywhere with ease. Over the past year I have rebuilt my Judaica library in eBook format, so that I can have my Jewish reference works with me and accessible at all times. Amazon offers an extensive catalogue that includes many (although not all) of the books I want to have with me, and they are often less expensive than the “dead tree” variety. Unlike Apple’s iBook Store, Amazon has taken the route of ubiquity by making it possible to read Kindle books on an Amazon Kindle, every Apple device, most Android devices, Apple and Windows computers, and Windows Phone 7 devices. The app was released when the iTunes App Store first went live, and, as a result, it is already a “mature” eBook reader that is fully featured and easy to use. You can take notes while reading, and they will be “synced” with your Kindle account and with any other devices you have that are running the Kindle software. That means your books and your saved places within them will sync and be accessible on other devices running the Kindle app and through the web. I have found this quite useful when preparing sermons and classes. A guide to NJ synagogues hosting community Passover seders.